Pricey, and lacks a broadband modem, but it delivers on getting those pings down, whatever your broadband setup. Not fazed by tricky architectural conditions. The Netgear Nighthawk Pro Gaming XR500 is a router that's specifically designed for homes with one - or more - serious gamers living there. With the possible exception of streaming TV and video in 4K, by far the most significant chunk of broadband bandwidth is taken up by online videogames. Whether you’re playing PUBG, Call of Duty or Overwatch, your broadband connection really matters – suffering from a high “ping” (effectively the latency that occurs between you hitting a button in a game, and that signal reaching the game’s server) can wreck your chances of success if you’re playing against someone with faster broadband. So, it’s a wonder that more hardware manufacturers haven’t come out with routers specifically designed to supercharge our online gaming. That is what Netgear’s Nighthawk Pro Gaming XR500 router is all about. 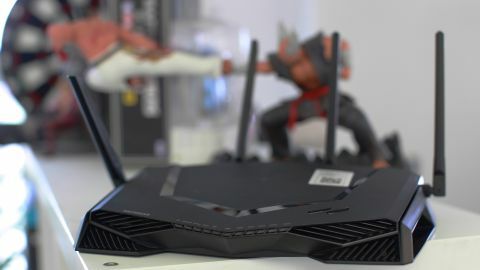 It’s an unashamedly top-end router, as the $297 (£239.99, around AU$400) price makes abundantly clear, and its raison d’etre is purely to give keen online gamers the edge as far as connectivity is concerned. The way in which it proposes to do that is driven, unexpectedly, more by its software than its hardware. It comes with a software package called DumaOS, developed by a company called NetDuma based in Bedfordshire in the UK, which includes many features that any keen online gamer will long have craved, such as the ability to force connection to the nearest geographical server, and to restrict the broadband use of non-gaming devices connected to the Nighthawk XR500. Which isn’t to suggest that, hardware-wise, the XR500 is anything less than state-of-the-art: it sports a 1.7GHz dual-core processor, five Gigabit Ethernet ports and a 2.6Gbps overall Wi-fi speed rating. It supports dual (2.4GHz and 5Ghz) band operation and has a feature called DFS (Dynamic Frequency Selection), which lets you tinker with the 5GHz channel if you’re experiencing interference. Under the bonnet, it’s not dissimilar to Netgear’s otherwise top-of-the-range (but significantly cheaper) R7800 router. Physically, you can also see that it has been designed with a gaming audience squarely in mind. It eschews the standard dull, boxy router form-factor in favour of a more pimped-up, aggressively sculpted form that puts one in mind of a hot-hatch fitted with an after-market body kit. It’s quite large and can only sit flat, taking up a fair amount of real estate. Setup-wise, the XR500 is pretty exemplary, but with one caveat. The problem being that it doesn’t contain a broadband modem, the component that allows it to connect to and interpret the signal coming in from a standard broadband socket. If you’re lucky enough to have fibre broadband, its socket should come with a standard Ethernet port to which the XR500 can connect directly. Netgear explains the lack of a broadband modem as a design decision which reflects the XR500’s global appeal. And, that design decision complicates setup, particularly since the documentation merely mentions in passing that you must hook it up via Ethernet to a broadband modem. Netgear does make a standalone modem, the DM200, which you can pick up for about $45/£35/AU$60. But even that seems a bit rich when you’ve shelled out a hefty amount on a router, so in practice, you’re best off hooking it up via Ethernet to your existing router. Which feels a bit clunky, as well as wasteful in terms of energy. It's worth pointing out that in certain markets routers with built-in modems are rarer, especially in this price range. Of course, if you subscribe to cable broadband, then the internal modem would be of no use, anyway. Still, it would have been an nice option to have. The results make it worthwhile, though: even when tapping into another router’s modem, the Nighthawk XR500 performs something akin to magic. In a fibre broadband setup, with the original ISP modem and the XR500 two storeys above the PC and Xbox One being used as test-beds, we were able to average 12Mbps with the base modem, which was bumped up to an average of 20Mbps using a Netgear range extender. But, with the Nighthawk XR500 running through the modemb, the true potential of the broadband coming into the house was properly opened up. Instantly, we got a rock-solid 60Mbps, with the full rated speed of 100Mbps being touched occasionally – without requiring recourse to the range-extender. The Nighthawk XR500 is fabulously well equipped to cope with tricky physical surroundings. It has four chunky aerials, and the way in which it cut through two storeys with ease was mighty impressive. It proved a massive boon when downloading a 30Gb game, a process which it executed in less than an hour, whereas even with the (somewhat temperamental) range extender augmenting the ISP modem, a similarly sized game took well over three hours to download. The acid test, though, came when we hooked it up to a much slower home broadband, through a pretty unimpressive (although much faster than the original router supplied with the broadband implementation) TP-Link router. A steady 9.8Mbps download speed was instantly bumped up to 16.9Mbps. The poor quality of routers dished out by some ISP providers has long been a complaint of ours, and one which the Nighthawk XR500 cruelly exposes. There’s a good chance that your broadband is a lot faster than you think it is, and once you start playing around with the Nighthawk XR500’s DumaOS software, you should be able to extract pretty much every drop of the available bandwidth. We experimented by setting up an intense download in one part of the house, then fired up Destiny 2, getting a not-too-disastrous but still far from ideal ping of 120ms. The first element of DumaOS we then visited was its Geo Filter, which sniffs out the geographical whereabouts of whichever server your game is hooked up to and lets you force a connection to servers within whatever geographical radius you choose. Moving from a European server to a British one (where we ran the tests) instantly got the ping down to 70ms (gamers view pings of over 100ms as annoyingly slow). A visit to another two DumaOS apps called Network Monitoring and QoS (which stands for Quality of Service) soon let us reduce that ping to 20ms. Frankly, Network Monitoring is the app which you would like to see supplied with every router – and especially if you live in a shared house (although in that situation, it could lead to some rather fraught power-struggles). That’s because it shows you every device hooked up to your router, and lets you grab set amounts of bandwidth for each one. QoS is more game-focused, and it essentially grabs a set chunk of bandwidth for whichever gaming device you designate, guarding against traffic-spikes from other devices on your WiFfi network, and thereby maintaining your ping if, say, you’re taking part in a crucial online match. It’s particularly handy if you’re a dedicated gamer suffering with lacklustre broadband speeds. DumaOS also has a nice dashboard screen, which lets you lay out and resize its various app windows according to the priorities dictated by your broadband setup and your online proclivities. Sure, it leads to a pretty techy-looking screen, but the control it gives you over your broadband feels almost God-like. It’s a piece of software which is sure to be copied by Netgear’s rival router manufacturers (at least, it will be if they have any sense). But right now, Netgear has an exclusive licence for it. Overall, it’s no exaggeration to say that the Netgear Nighthawk XR500 is simply the best router a keen gamer can buy. Whether those gamers are struggling to extract all available performance from a sketchy broadband setup, or to get the full benefit from a faster broadband pipe, they will find it massively impressive. And, if you aren’t a gamer, but live in a shared house in which your fellow inhabitants are constantly locked in a battle to grab bandwidth, it’s also well worth buying. Sure, it’s eye-wateringly expensive and its lack of a broadband modem is, in our opinion, a major faux pas. But once you fire up its DumaOS software and start to discover how quickly and reliably you can get your broadband to run, you will find it to be a revelation. Netgear’s Nighthawk Pro Gaming XR500 is currently the best router a gamer can buy – as, arguably, it should be at that price. The control which its DumaOS software offers over devices on your Wi-Fi network is nothing short of a revelation.